You can’t get a taste of Hanover without visiting one of our markets; from the old-fashioned farmer’s market to locally-sourced specialty foods, local markets bring a taste of Hanover to your home. Spending a Saturday morning at the Hanover Market house sends you back in time; back to a much simpler way of life. Fresh fruits and vegetables, hand-cut meats, local crafters and mouth-watering pastries are all staples inside the market house, located on E. Chestnut Street since 1933. Originally an open air building located on center square, the first market house was built in 1815. In addition to produce, this early market also housed the town’s only jail cell. During the Civil War, soldiers on horseback rode through the market, thinking it a covered bridge. This building was torn down in 1872, and the market was located for some time in the Hanover Opera House on West Chestnut Street. The current market building was erected in 1933, to replace a dance hall that was attracting an ‘unsavory crowd’, according to the market’s website. 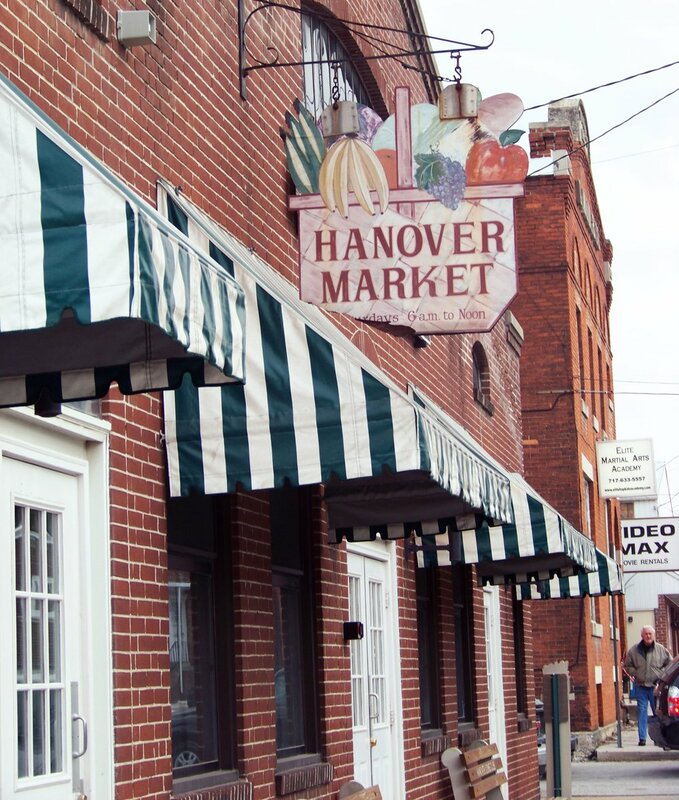 For the past 80 years, the Hanover Market house has been home to vendors selling everything from fresh produce, meats and baked goods to crafts, décor and specialty items. “The market is truly a one stop shop,” said Christopher Arter, owner of Christopher Cringle’s. Arter set up shop in the market house after a few years of waiting for a space to open. The market offers an affordable alternative to opening up a brick and mortar location, important for Arter and other vendors who have full time jobs outside of their market stand. Arter’s space is one of those that stands out in the market house. Serving as Hanover’s Christmas specialists, Christopher Cringle’s offers a wide selection of hard-to-find seasonal lighting, decorations, and even giftware and other holiday décor, including Halloween and patriotic items. Their unique expertise also includes pre-lit tree repair and custom holiday decorating. Locals will pack the Hanover Market House early, but 30-plus vendors are open Saturdays from 6 a.m. to 12 p.m., year round. Two restaurants serve both breakfast and lunch; perfect for the early-bird and the late risers. The Carriage House isn’t the only spot for Pennsylvania Dutch traditions in Hanover. At The Markets at Hanover, located on Broadway, shoppers will find themselves faced with a wide array of PA Dutch treats including sho-fly and whoopee pies, scrapple or panhaas, and pantry staples like pickles, jams and jellies. Shady Maple, a Lancaster County favorite, has set up shop in Hanover to offer its famous baked goods, bulk baking supplies and fresh bread. Continuing the theme of local produce, the Markets at Hanover also feature a number of farm stands that stock fresh fruits and vegetables for the local-minded shopper. Elizabeth Silbaugh-Johnides, manager of The Markets at Hanover, sees the markets as an incubator for fledgling businesses and entrepreneurs. With low overhead, the markets offer a trial period for businesses to test the water with their products. As businesses look to markets to get their footing, Hanover shoppers also turn to the markets as a must-stop in their shopping routine. Once a tradition of their parents and grandparents, younger people are making a habit of stopping by a market on a regular basis.